The primary purpose of the edit was to manipulate the events of BTTF1 to allow the 1955 scenes in BTTF1 to run chronologically parallel to the 1955 scenes in BTTF2, we see how November 12 1955 played out the second time around with two Martys and two Doc Browns inhabiting Hill Valley. I also thought the movies fit the ‘teatime sci-fi tvshow’ format well so a lot of work went into creating the previously, intro titles, end titles and ‘next time’ teaser for each episode ending on a cliff hanger where possible. Trivia for Mary Steenburgen fans, some audio effects used in her 1979 time travel movie with Malcolm Mcdowell 'Time After Time' were used in one of the episodes. Massive Thanks to That One Guy for taking the time to review and ultimately approve the edit. A huge thanks to Scribbling Man for previewing the edit and coming up with some great ideas for improvements to the narrative and spotting some badly needed fixes. To SonOfSinbad also for meticulously checking each episode for anything that needed tweaking. Also big thanks to TheRyaney for the coverart (a fabulous job on that!) and to anyone else who made suggestions in the ITW thread, it was a very collaborative process on this one which I for one thoroughly enjoyed! Episode 10: Back To The Future? Essentially this is a re-ordering of events and scenes rather than any drastic cuts to any of the movies. The edit is spread over ten episodes with all original credit sequences/end titles from each movie removed. - There are some trims and minor cuts to the 1955 scenes from BTTF1 and BTTF2 to help the intercutting of both movies during the Enchantment Under The Sea Dance, BTTF1's Clocktower finale and Biff and Marty's Almanac chase in BTTF2. - Minor trims elsewhere to support the new TV format. - New TV titles for each episode. - 'Previously' and 'Next Time' teaser created for each episode. "Great Scott! I remember this! This is how people used to watch TV. There would be a cliffhanger and you'd wait a week to find out what happened. And they had these teaser trailers right before and after the commercials, to entice you to stay tuned in the hope of glimpsing something new." "You mean there was no binge-watching? And you couldn't skip over the commercials? Heavy!" The Hill Valley Chronicles succeeds in transporting you through time, to your own youth when weekly episodes of star shows influenced the schedules of our daily lives. No re-runs, no pause button. We need to be home in time to find out what happens next to Marty and Doc! The concept of this edit is perfect: feel transported 30 years into your past while watching our heroes travel the same amount of time. For everyone old enough to have seen Back to the Future the first time around, this edit is a delightful double treat of time travel. The hardest part is to muster the patience to watch the series as you would have in the '80s: one episode a week and no fast-forward (I failed, I watched the series over two weeks). There are individual moments where this format feels repetitive, including the elaborate Previously and Next teasers. But that is partially my fault for not waiting a week before watching the next episode! Partially also because there are no commercial blocks between the teasers and the episodes. Visual and audio editing is excellent. Narrative editing stands out on an inspirational level. This has me re-examining my favorite movies with the thought "what can I do with this narrative?". Heartily recommended! Quality was good. My preference was to watch the black and white/sepia(ish) versions, which for me really added a whole new dimension, and these looked good. Occasionally there's the odd scene that's a little too dark, but nothing major. The "sepia" isn't really sepia, but more of a grainy, desaturated look akin to what you'd expect from an older Western - so this was apt and worked well. Only complaint here (once again, very minor) was that the old-film style "tracking" was a little predictable and annoying at times, but you learn to look past it. If I could change anything, I'd lose the "old film" filter and just use film grain and colour correction. Audio wise I had only one issue - I hadn't noticed this with previous incarnations of the edit - but during a couple of scenes at the undersea dance in episode six, the audio bit rate sounded noticeably low at times (sort of phasery). I suppose this could have been a byproduct of either changing the key or stretching the audio, which may have been something the editor needed to do – I don't know. Either way, considering the scope of the edit, it's pretty minor and I didn't notice anything similar on any of the other episodes. Editing is very good and the opening titles are beautifully done, setting the scene well for what's to come - I never felt the need to skip it (It's like Stranger Things all over again). During episodes. there is the odd cut here and there which is a little sudden, most of which occur at the end of the BTTF3 episodes. Given what there is to work with though, I imagine it's very difficult to get these looking natural. Narrative wise, I think the editor had made the right choice as to where to cut at the end of episodes and, although most of the endings felt quite abrupt, this was made up for with the episode openings which were well chosen and really felt like the start of a new episode. Narrative was good, although flawed. Having Marty wake up as if from a dream instead of showing us the 1955 events was a genius way of letting us see all of the 1955 scenes eventually play together. It does create some initial confusion, but flashbacks have been inserted to imply that even though WE aren't aware of what's happened, Marty is - and when we finally hit "Temporal junction point of the entire time/space continuum day", you forgive and forget. It's just SO MUCH FUN. Enjoyment is high, because (read previous sentence). It's odd really, but there's something about the episodic format that makes you want to binge something that you probably wouldn't be as keen to binge in its original cinematic form. On the other end of the spectrum, it's also just really nice to have the option of sticking on a 30 minute episode of BTTF and not needing to commit to watching the entire film. This is also the most I've ever enjoyed Back To The Future 3, which I've never really rated. 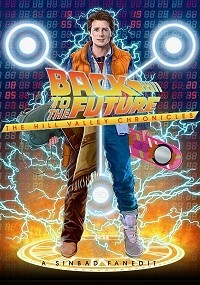 Hill Valley Chronicles is a homage, and in no way intended as a fan fix – however, although the original BTTF is a sacred cow, this edit is definitely my preferred viewing method for parts two and three of the franchise. My final qualm, which is preferential, is that I preferred the non-extended version of episode six (which is how it existed in an earlier form). I really enjoyed the bite -sized format so, even though it works as a sort of "special", it just felt a bit too long for me and I missed the cliffhanger that the original, shorter version had. Well, I've now seen this many, many times over via several different versions (mostly due to giving feedback to the editor prior to release)... one would think I'd be tired of it, wouldn't one? This was pretty darn great. There were some flaws here and there, but no deal-breakers. The structure of the plot and the episode breaks were handled quite well. The only big issue I had with this were Episodes 5 & 6, which I felt were too long and didn't flow well for me. Also, the various "Previously On" and "Next Time On" segments were too long. Other than that this was a great way to rewatch the Back to the Future saga. This edit is a lot of fun. It provides a great, creative way to rewatch a trilogy that many have seen several times over already. The custom title cards, opening sequence and "previously on" are exceptionally well done and work well to sell it as a TV show. It's not perfect though. I felt that the first three episodes had some narrative inconsistencies that weren't explained and the editing could've been a bit tighter to make it seem like a real TV show. But it's a small complaint. Where this edit really shines is in the middle episodes. The B&W treatment of the 1955 segment is stunning and fits perfectly. I almost wish the editor hadn't given the option of watching these episodes in colour, because B&W is far better. Episode 6 is worth the price of admission alone. The way the editor ramped up the action to the climax of this episode was brilliant. The narrative through 1955 can seem a bit confusing, but if you could keep up with Westworld, you shouldn't have an issue with this. After that, it's basically BTTF3 edited into 3 episodes. It's less inspired than the 1955 segment, but there's only so much you can do with the source. It does its job. But, I think the editor missed a huge opportunity here. We start off in colour when we're in 1985 and 2015. We go back to 1955 and we're in B&W. Wonderful! We go even further back to 1885 and... we're back in colour? This would've been an excellent opportunity to go into a scratchy B&W, silent era look or even a sepia tone. The switch back to colour doesn't fit with the aesthetic (unless you watch it all in colour, I guess). In the end, this is an impressive edit and well worth your time. Highly recommended. Woo hoo! I've only just seen two episodes, as I'm following the weekly posts, but I can already sum up that this is great! Credits look stunning and professional, previously and next are also very well done. The cliffhangers that ends these episodes work very well, and keeps you interested, especially if you're not on Netflix and binge watching everything. That montage of 1955 in the first episode really works, as well as looks great. Flashbacks for old Biff too, fits into the story with no major headaches. Edits are great, video quality looks fine even when watching on Vimeo stream. It definitely works and would recommend anyone that has a copy tune in!